Pros: So I got this piece and it looks very nice. Hits hard, and it does create a tornado which also acts as an ice pinch. Cons: When putting the bowl piece into the downstem just after opening the box the downstem shattered and cut me. It was a very cheap downstem, and when I emailed them about it they refused to help me, and ignored my emails. 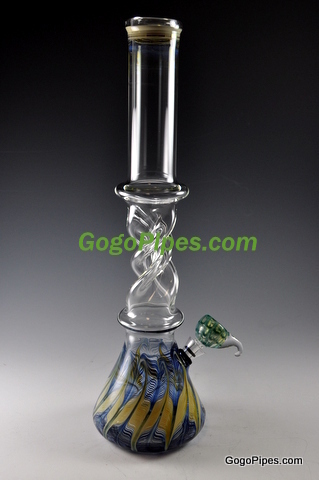 I had to run out to my headshop to purchase a more high quality downstem. Comments: Hits like a champ with new downstem. Good looking. Bad service, cheap parts. Pros: Solid. well made,ice-catcher too,tall breakers don't seem to turn over as easy as others, I like that. Great paint job, got the red with white, beautiful. Hits hard but smooth. One bowl will Fry you. Cons: Buy the cleaner !!!! You'll need screens, bowl is big, so is the hole! Comments: Too good look'n to use as a party bong. This thing will impress your friends. 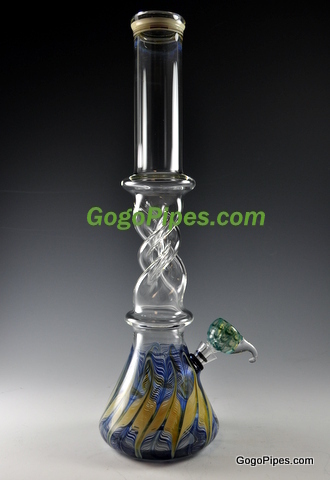 I only buy from GOGO pipes now, best prices and service, recommend them to all my friends. Pros: Ordered on Sunday with the fastest shipping method, arrived on Thursday. No chips or cracks, the glass is in perfect condition and seems solid and thick. The swirl design does create a sort of tornado effect with the smoke -- more noticeable with a slower hit. The bowl is decently sized and its handle seems sturdy. Simple, good looking designs. Love it already. Comments: This thing rips like crazy. Smooth, too. Had me fully stoned in one strong hit. Haven't tried filling it with ice yet, but I'm sure that will make it that much smoother. Comments: Even with the cons i suggest you check this out because of the awesome hits it gives.